Rodenbach | Beer Blotter: Seattle based. World focused. d.b.a. in Williamsburg, Brooklyn- stop by for cask fest! After a weekend of Hoppin’ Frog, Jolly Pumpkin, Naked City’s own brews and Rodenbach, I present to you, the next week of beer events. Stop by and sample one of the greats from the Mid-West: Great Lakes Brewing Co. from Cleveland Ohio will be serving Dortmunder Gold (Dortmunder), Edmund Fitzgerald (Porter), Eliot Ness (Dark Amber), Burning River (Pale Ale) and Commodore Perry (IPA). Bring a business card and drop it in the bucket, at the end of the tasting we will draw a name for a six pack of beer. Try out BrewDog from Scotland. Punk IPA, Rip Tide Stout, Dogma, Paradox Smokehead and Paradox Isle of Arran will be sampled. Samples flights from Dogfish Head Brewing, a innovative brewery out of Delaware. On draft will be: Red & White; Black & Blue; Burton Baton; Chateau Jiahu; Palo Santo Marron and Midas Touch. Fingers crossed, as there might be some 90 Minute & Raison D’Etre available. Southern Tier Brewing Co. ‘s IPA, 422, Unearthly Imperial IPA, and Iniquity Imperial Black Ale will all be on tap along with other Southern Tier bottles. GOOD TIMES. New Hampshire’s very own Smuttynose Brewing Co. is on the board tonight. Although the beers available for tasting have not been listed, fingers cross for their IPA and Wheatwine! 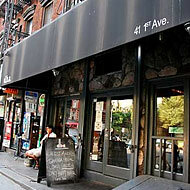 Great place in BK (there is also one in New Orleans) – tonight (according to ratebeer.com) expect about 16 rare and tasty cask beers to be pouring over the weekend, all tapped at once, including beers not normally seen in cask in NYC. Beer range is courtesy of Alex Hall (BA: Imbiber) in conjunction with Ray Deter of ‘dba’. Beer will come in half pint and 16oz measures, there’s no entry fee and you pay by the glass. Italians are known for pizza, art, pasta and wine- but tonight, come sample 18 different Italian brews. Great Week! At least three of my top ten breweries are having a tasting this week. This weekend we had the conversation of our top 10 US breweries. I could only come up with 9 off the top of my head. What are your favorite breweries? Leave a comment or email me at jess@beerblotter.com with an event you want us to post or to just start a dialogue about your favorite brewery! We are back tracking to week nine, one of the two weeks we spent in Belgium. If I said I wanted to go back there tomorrow and live for all eternity….that would be an understatement. FOOD OPTIONS: No food options. Remember we are in Belgium. They drink all day on an empty stomach and so should you! STAFF OPINIONS: A small establishment, there were two bartenders, one of which we had the pleasure of interacting with. 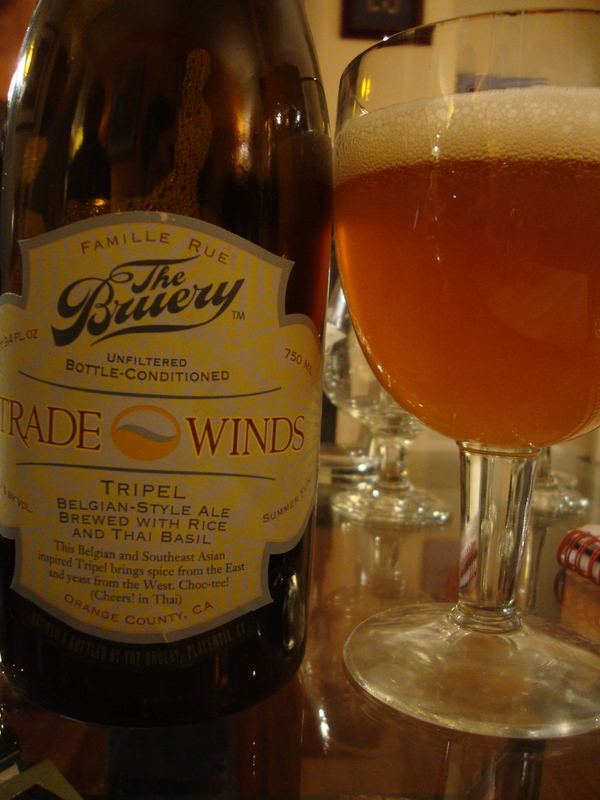 He, like many, if not all Belgium residents knew his beer….he knew it well. He discussed 3 of the brews on tap that were the house beers and suggested we try them all. 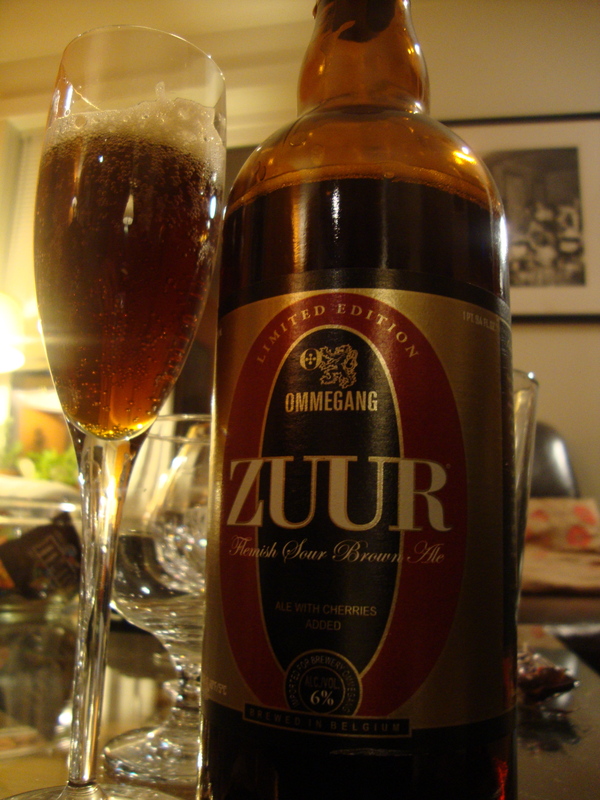 (Interesting, rare beers on draft are hard to come by in Belgium, a country that prides themselves on aged bottles). He was pleasant, informative and happy to introduce beers that we had never had into our lives. We are forever indebted. Ghent was the first stop outside of Antwerp that we made in Belgium. 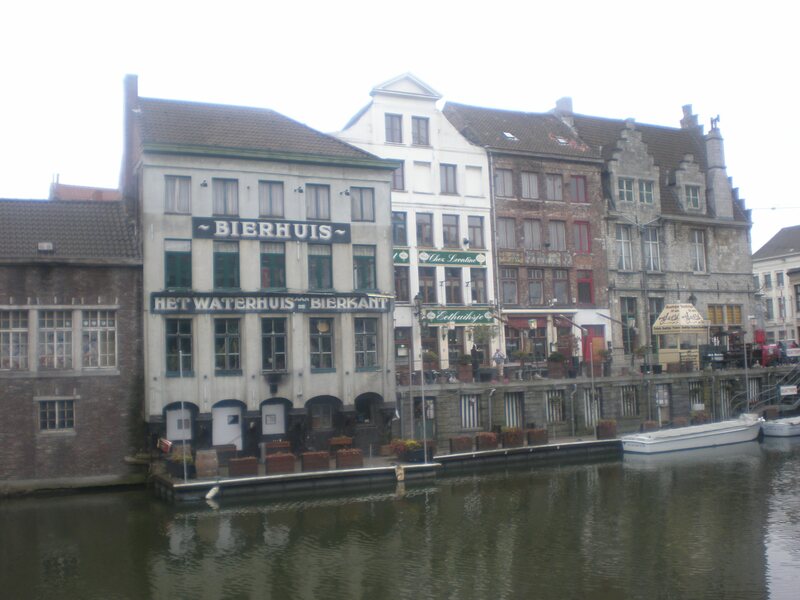 A city with so much history and beauty, Ghent has much to offer in the realms of beer and art. During our stay we encountered medieval churches, bell towers, castles, canals and quaint squares. Although these elements of the city were preserved, Pizza Huts and modern hotels proved that Ghent was a city of the past and of the future. 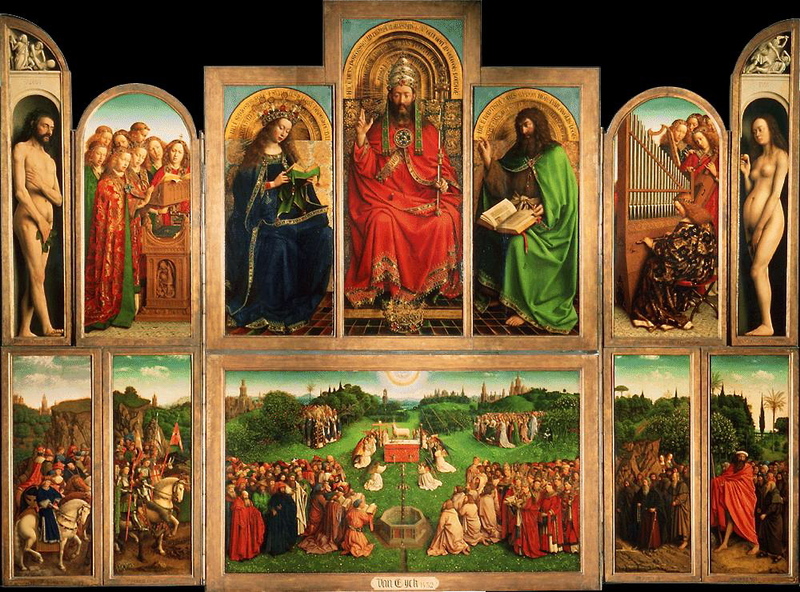 Prior to stopping at the Waterhuis, we ventured into Saint Bavo Cathedral to see the Ghent Altarpiece, otherwise known as the Altarpiece of the Mystic Lamb by Hubert and Jan Van Eyck. Completed in the early 15th Century, this masterpiece was very high on my bucket list and is the single most impressive piece of artwork I have ever seen. The picture in this post is from the internet, as you are not allowed to take photos of the piece. After taking in our art for the day, we head over to Het Waterhuis located along side a canal and therefore appropriately named in more ways than one. A modest space with old, almost rotting wood paneling along the floor, a layer of dust and a cloud of smoke, this bar would not exist in the US and this is why we love it. We find a space in the back with a barrel surrounded by four chairs next to a window looking out onto the water with a castle in the back drop. Dried hops hang from the bar with bottles, many of which we had yet to try, layered with dust and mold that lined the wall. We sat in awe of the country we just arrived in, in awe of the beer we were drinking. Het Waterhuis was one of many beer experiences to come. It was amazingly worthy of our top spot to date. After an amazing beer weekend in Portland, Oregon (more on that tomorrow), Beer Blotter is back on schedule with your weekly events. The weeks just keep passing us by and many great beer related festivals await us here in Seattle (Belgiumfest 2010 and Strangebrew festival). But for now, here is what’s going on in Beer USA. We are already on day 11 of 31. Yes, thats right, Stout Fest runs from January 1, 2010 until January 31, 2010- every single day. The goal? Well Quenchers has created four groups with five stouts in each group (buy four stouts, get one free). Spend the month of January drinking as many stouts as possible and “closing out” each group and winning congratulatory stouts. Here a beer from each group: Founder’s Breakfast Stout, Avery’s Out of Bounds Stout, Hitachino Espresso Stout and Left Hand Oak Aged Imp. Stout. Details from ratebeer.com state, “Special guests Michael Bell and John Host from Founders Brewing Co. will be in to tap Founders Black Biscuit, an old ale/porter that was aged in a maple bourbon barrel that was stored in the old gypsum mines beneath Grand Rapids. 11% abv 50 ibu’s .” Founders is a one of a kind brewery and specializes in stouts and porters. This event is not to be missed. 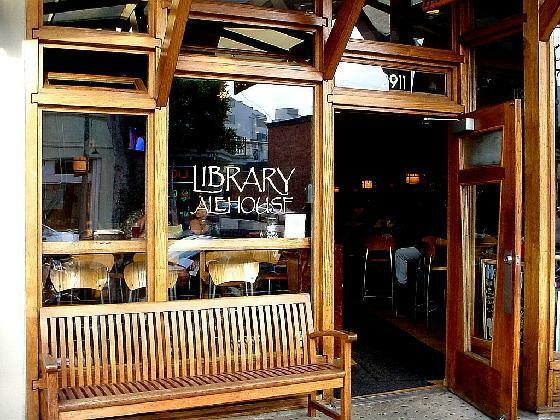 It is free and 50% happy hour prices will apply between the hours of 7:00PM and 8:00PM. Stop by High Street Grill and enjoy a pint of Weyerbacker’s Fireside Ale, a dark ale with a hint of roasted, smoke flavor. From 7:00PM-10:00PM this beer will be featured along side 16 other taps, live Irish music and $10.00 all you can eat mussels. A perfect food paring for a beer with a rich maltiness, slight bitterness and robust flavor. If you do not go to this event, we will be so disappointed! Not only can you enjoy a pizza from Rocky’s, you get to try 10 or more beers from 3 Floyd’s Brewing Co. What the beer drinkers of Seattle would do for such an event! Here….it….is….Moloko, a sweet stout, Dreadnaught IPA, Ham on Rye, Broo Doo, an Oktober style brew, Pride and Joy, Alpha King, Gumballhead, Alpha Klaus, Robert the Bruce, Großer Kurfürst, and Alpha King on cask. Not to mention, Lincoln Anderson will be there from the brewery! 20 taps are a flowing tonight and all of them are from Goose Island Brewery. In our humble opinion here are a few you should try: Matilda, Bourbon County Stout, Pere Jacques and Demolition. The following Dogfish Head beers will be tapped this Thursday, World Wide Stout, 120 Minute IPA and Burton Baton. Do not forget all the free giveaway and the buffalo wings that patron’s rave about! For only two hours, you can come experience the great beers of the Mid-western state that is Michigan. Featured breweries include Atwater, Founders, Arcadia, Michigan, Mount Pleasant, Shorts, Bell’s, New Holland, Dark Horse and Dragonmead. $15 Advance, $20 at door, includes 10 samples, snacks, and a raffle drawing. There is a whole lot going on in these two hours! The price of this festival rivals that of many at $30.00. The major difference is that you get 30 tastes! Make sure you grab some food during and stay hydrated! 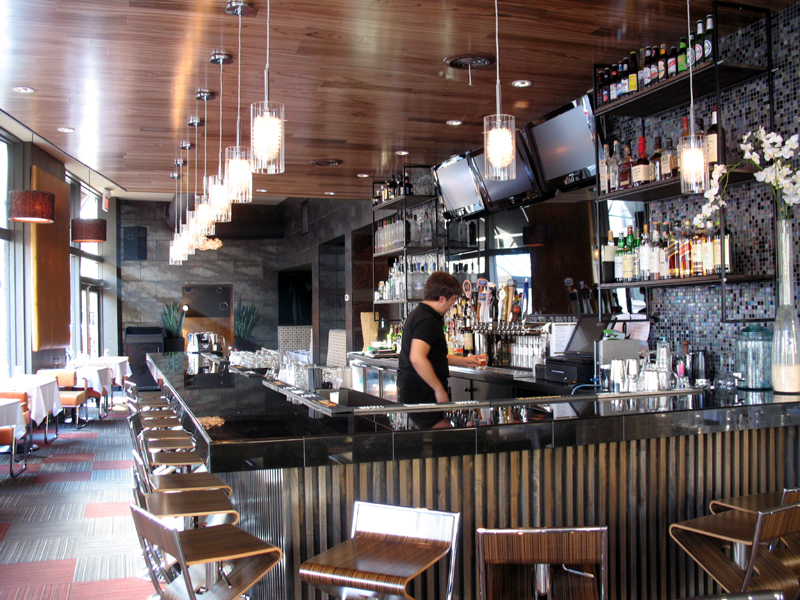 Live music and amazing food will accompany a line of beers worth the trek across Canada. Dogfish head features their Chicory Stout, Great Divide’s Old Ruffian Barleywine will grace the stage, Midnight Sun Brewing Co. has 10 beers for pouring (TEN! 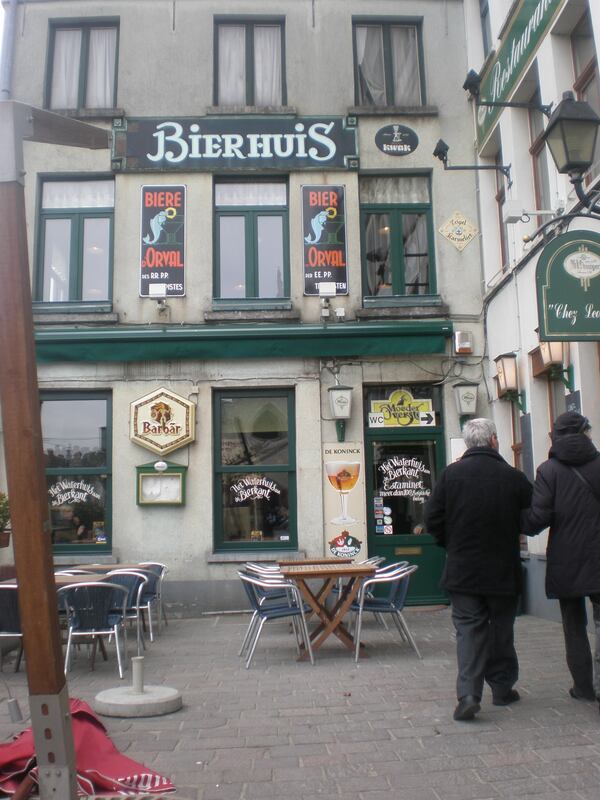 ), Brewery Ommegang., Orval, Rochefort, Rodenbach…it certainly does not start nor stop there. Check out the event’s official website here! 5:00PM- 8:00PM @ Avery Brewing Co.
Straight from “source”–> Be there to make sure you get some bottles of this incredible and indelibly unique brew. Imperial Oatmeal Stout aged in Gosling’s Rum barrels. Huge. Chewy. Endlessly deep. Smooth beyond belief with endless amounts of subtle flavors that work their way out as you sip. 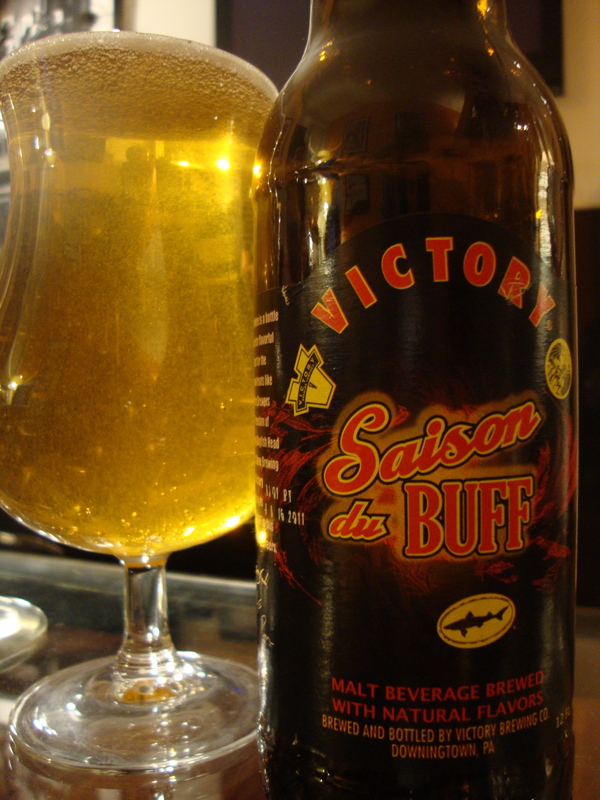 This beer is so good that you can quaff a pint or sip and savor a few ounces with equal ease. The only difficult part is deciding what you want to do with it! $8 per 12oz bottle. Max 6 bottles per customer. We’ll have just a tad over 300 cases of this beer (24/12oz.) to go around. Limited one time release, with a few cases being sent to select states. Coming to Black Tot Day at the Avery Tap Room is the only way to GUARANTEE that you get your hands on some bottles! We’ll also have 5 gallon kegs tapped of unoaked, rye barrel and bourbon barrel versions of the Imperial Oatmeal Stout, along with Black Tot itself. We’ll be pouring a single 5 gallon keg of each and no more…when they’re gone they’re gone! $3 per taster. No door charge! With over 150 vendors, local music and 300 beers, for $40.00 you can sample has little or as much as your heart and liver desire. For more information about the event click here and for pictures from the event last January, click right….here. Join Brewmaster Steve Altimari from Valley Brewing Company and Chef Sarah Schafer of Anchor & Hope for an evening of an exquisite pairing of beers and food. Click here to see the menu. 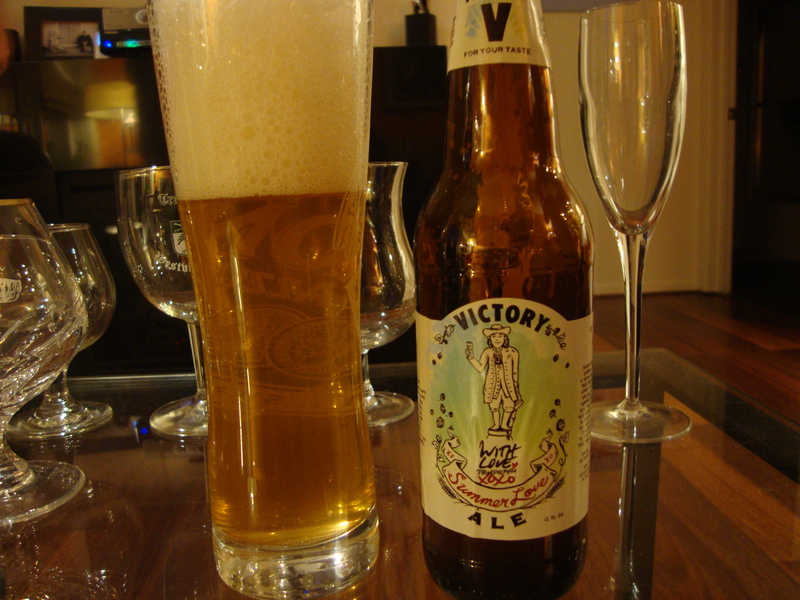 Victory Brewing out of Pennsylvia is featured at tonight’s beer and food pairing dinner. Tonight four beers will be paired with four dishes. The beers you can expect to taste include, Yakima Twilight, Wild Devil, Baltic Thunder and the very rare V-12. The holidays are surely over, as this week proved difficult in chosing which events to feature. From large beer festivals to small, intimate dinners, we hope those in attendance have a damn good time. If you attend any of the mentioned events, want to share an event or have any suggestions for the event blog, leave a comment or email us at beerblotter@gmail.com. Cheers and have a great beer drinking week!